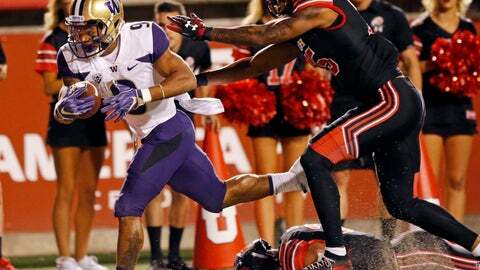 Washington hasn’t been to the Rose Bowl since the end of the 2000 season. UNDER PRESSURE: Utah’s defense is built on getting negative plays that force the opponent into difficult third-and-long situations. Utah leads the Pac-12 with 8.2 tackles for loss per game, which plays a big role in holding opposing offenses to a league-best 33.2 percent conversion rate on third down, when they are able to bring even more pressure on the quarterback. FANTASTIC FILL-INS: The Utes were dealt a big blow during a four-day span in early November when quarterback Tyler Huntley and running back Zack Moss went down with injuries. That duo accounted for 84 percent of Utah’s offense through nine games, but backups Jason Shelley and Armand Shyne have proved to be more than capable fill-ins. Shelley has committed no turnovers in three starts at quarterback, winning all three games. Shyne has averaged 92 yards rushing per game as the featured back with three TDs in that span. SPECIAL SPECIALISTS: The Utes have perhaps the nation’s top kicking duo in 2016 Ray Guy Award winner as top punter Mitch Wishnowsky and 2017 Lou Groza winner as top kicker Matt Gay. Wishnowsky ranks ninth in the nation this season, averaging 45.4 yards per punt, with 21 inside the 20-yard line and nine at or inside the 10. Wishnowsky has just nine touchbacks on 166 career punts. Gay leads the nation with 21 straight made field goals and is tied for best in the country with nine made kicks from at least 40 yards.